It’s Wednesday and I’ve been thinking about that moment ever since. 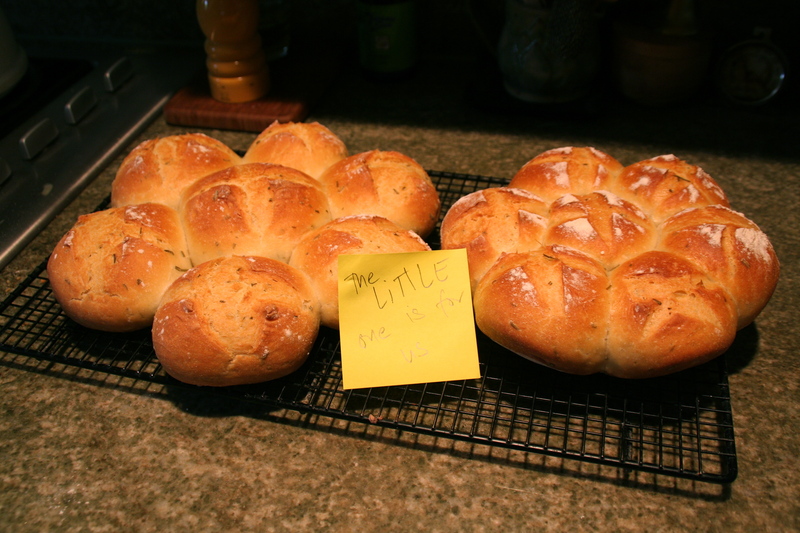 When I realized I’d have a few hours to bake today, I knew who needed a fresh ring of rosemary rolls, and a jar of homemade kumquat marmalade (so good!). He’s an incredible faster, that man, but I don’t want him to tumble from the altar with so many services left to go! 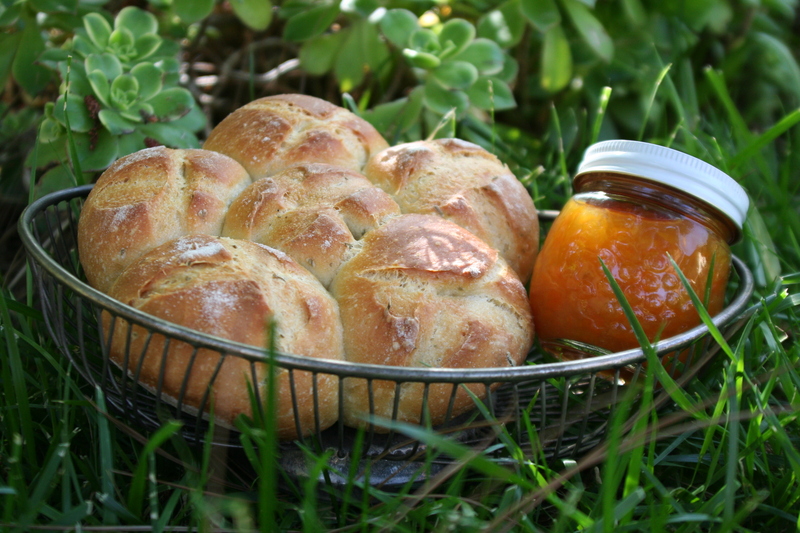 Rosemary rolls, and kumquat marmalade–to be handed over after unction tonight. It’s Holy Week for us Orthodox–blessings to all of you who are in the midst of this beauty. 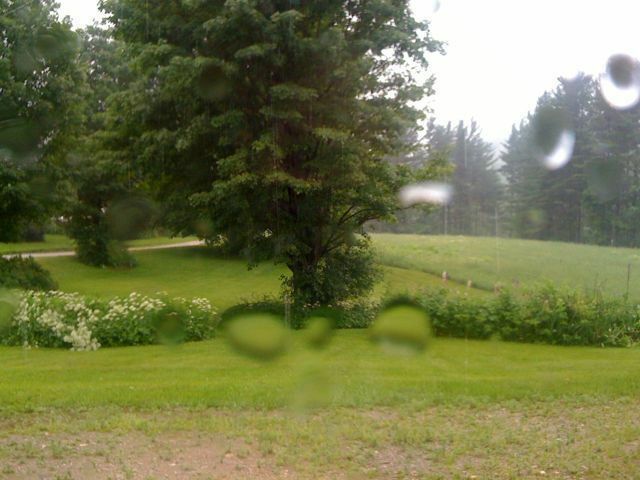 For those in Fort Collins, our old home town, digging out from the snow storm–I send you good wishes for an AMAZING summer (in which all of your vegetables grow enormous and every day brings sun and respite). And to the rest of you lovely folk, near and far–Cheers and happy baking and giving! Trick :: Long First Rise–What Then? 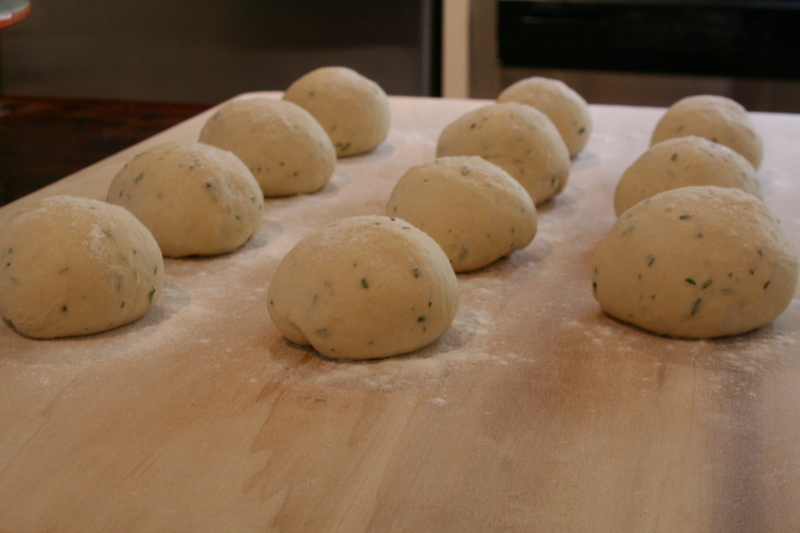 Photo of rosemary rolls by Matt Roberts, who made that fun movie about my bread giving..
Once you’ve baked for a bit and know what dough should look like at the various phases then it’s fairly easy to begin fudging here and there with ingredients, proofing times, and oven temperatures. Today, I will be away from the house for more than a first rise. I’ve been away from the house almost all week, which is why I haven’t been blogging or baking, because I’m spending this week in first grade. After the first day of school back in first grade I came straight home, flung off my boots, and took a two-hour nap. OH MY! But we have no bread in the house and children are begging. 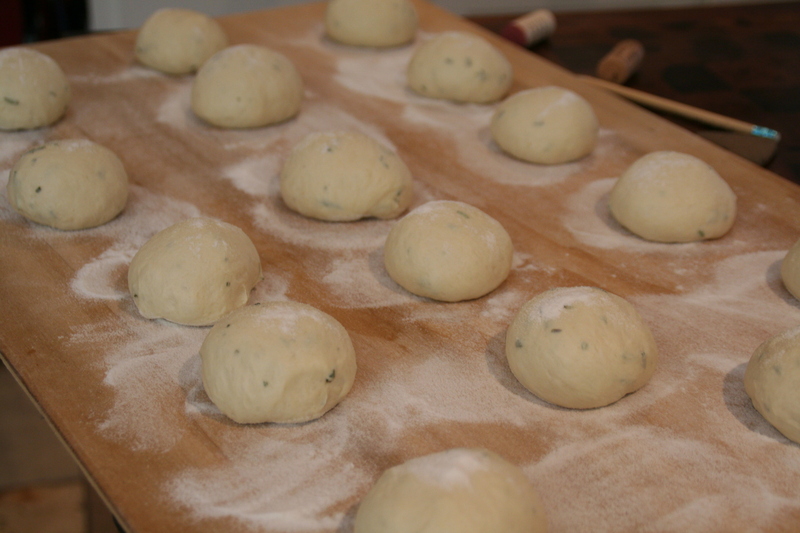 So, I’m mixing up some dough for rosemary rolls and here’s what I’ll do. Reduce the amount of yeast in my mix, add some sourdough starter, use cold water (I always use cold, filtered water) and make sure the dough isn’t sitting in a sunny place. Mix it all up and let it rise, rise, rise. When I come home, after about five hours of rising, the dough will have spent much of its energy. 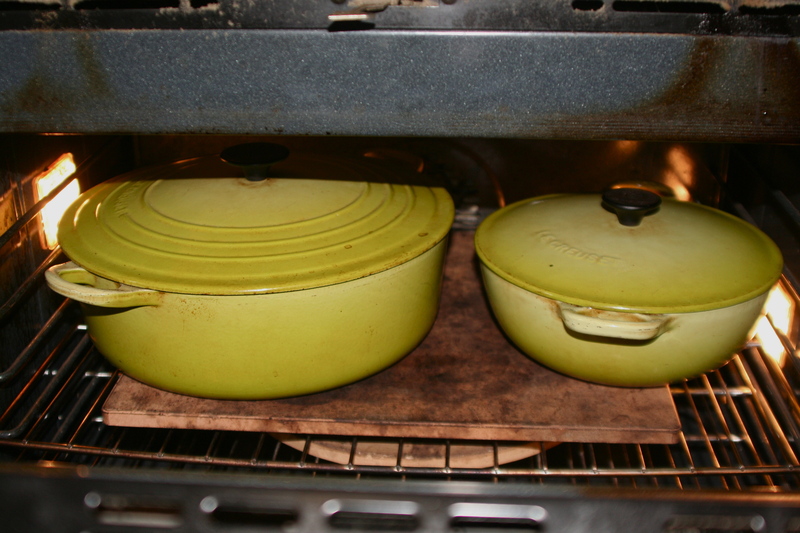 So… I’ll get the pots into the oven, heat it all up, and when the oven is close-ish to its 450 degrees I’ll shape the rolls and let them sit for about 10-15 minutes–maybe less–I’ll keep those eyes of mine wide open and decide then. If I let them have a long second rise then I’ll end up with flatbread. Not that I have anything against flatbread, but that’s not today’s mission! I’ve done this before, and it works. A long first rise means a very short second one. 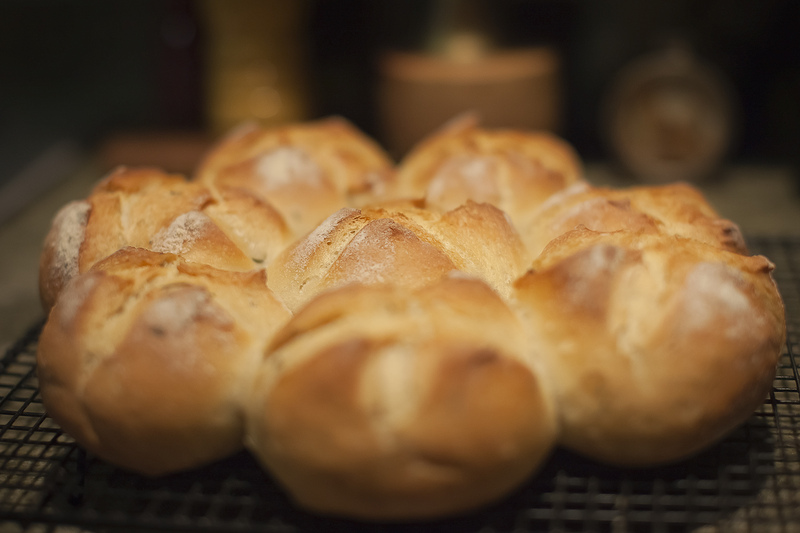 A short first rise means a longer first one–or maybe even two additional rises. We shouldn’t be slaves to our recipes and it’s pretty fun experimenting with yeasties to see just how they can be manipulated and stretched so that we’re not anxious and fretting about being in the kitchen when we really should be sitting in a desk learning first grade goodness! Two and a half more days to go and then I’m back to being a grown up. Cheer me on, would you?! 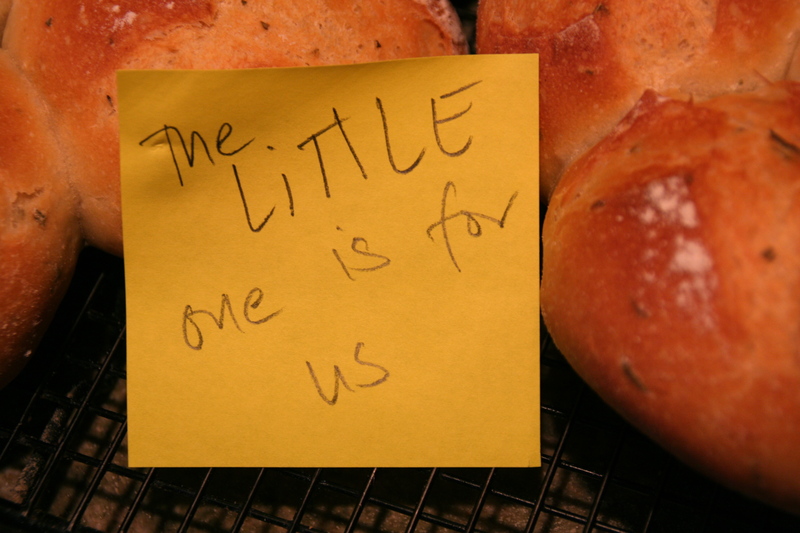 Sometimes, the little people see bread and it just vanishes. Even right before dinner. Does that happen in your house? And the note worked! 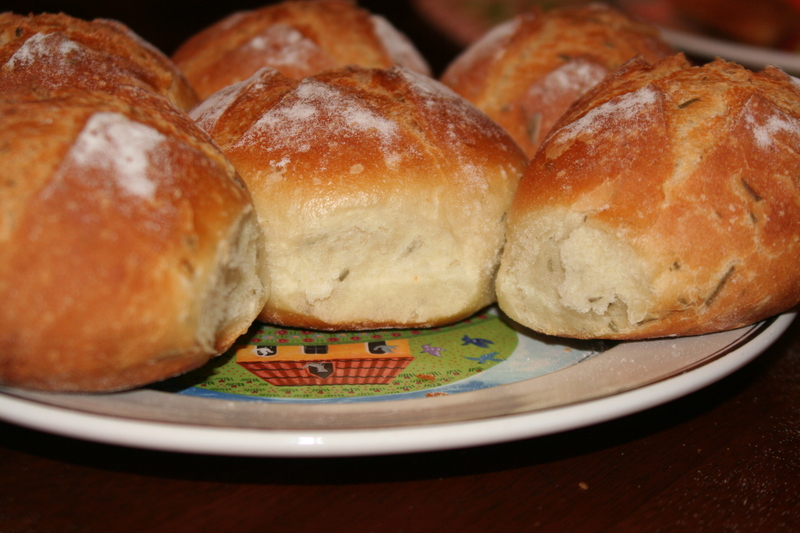 I returned from my running around and both beautiful rings of rolls were still on the counter, ready for giving. One for us, one for them, and that’s how the story ends. Gave to parents of brand-new-baby Salem Isabel! Here’s a recipe showing how I bake using my kitchen aid as a mixer. I love to mix my doughs by hand, but every now and again I end up using the machine. 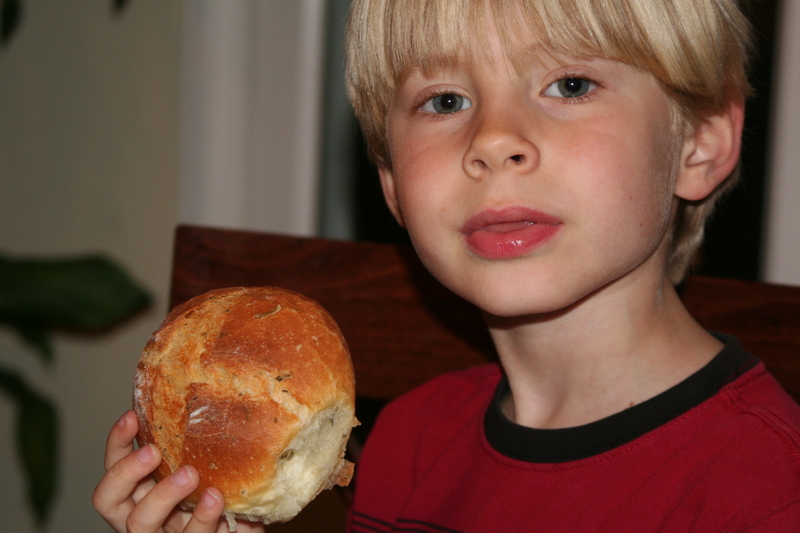 Recently, when my shoulder was giving me painful fits, it was the only way I was able to make bread using just one arm. 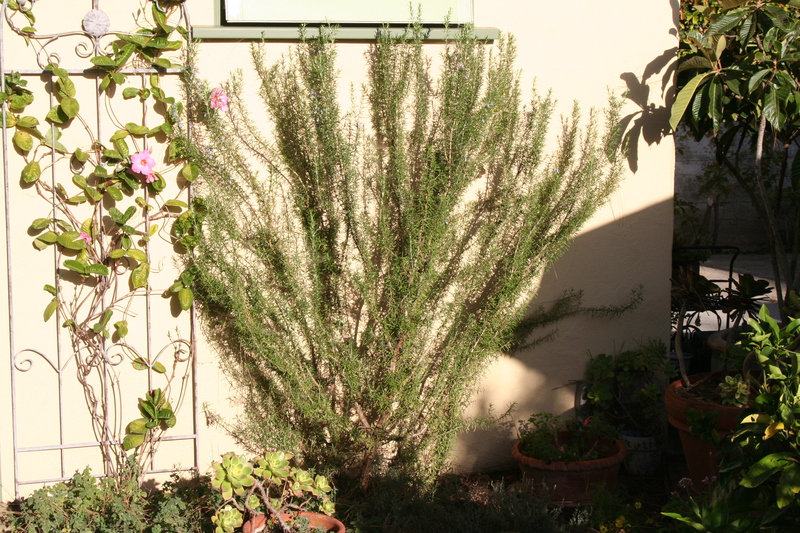 Rosemary grows like a wild weed here in Santa Barbara. Here’s a photo of one planted in our yard, which I’m trying to prune to fan out below my office window. Here is a quick recipe for one of my favorites! If you give it a whirl, I’d love to hear how the recipe worked for you. Time Commitment: Depending on the temperature in your kitchen, have to be in and out of the house for at least 3 1/2 hours in order to make these rolls. If you choose to retard the dough after the first rise, then it makes this recipe very flexible. Step One: Combine all dry ingredients in mixer bowl set with a dough hook. Mix for a quick minute, then add all of the water. Mix on second setting (not too fast and not too slow) for about 6-7 minutes. Step Two: Add rosemary. Mix for another two or so minutes. The dough should be flinging around the inside of the mixing bowl, hopefully not sticking to the sides of the bowl. If it’s really sticking, then add more flour little by little. 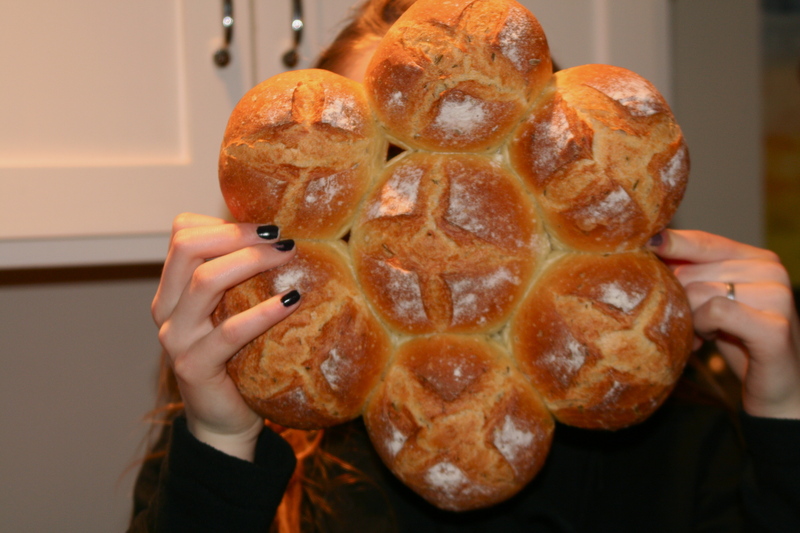 Be careful not to over-flour your dough; it makes the bread awfully dense. Do the dishes, or the laundry, or light a candle while the mixer does its work. Step Three: Oil a large glass or ceramic bowl. 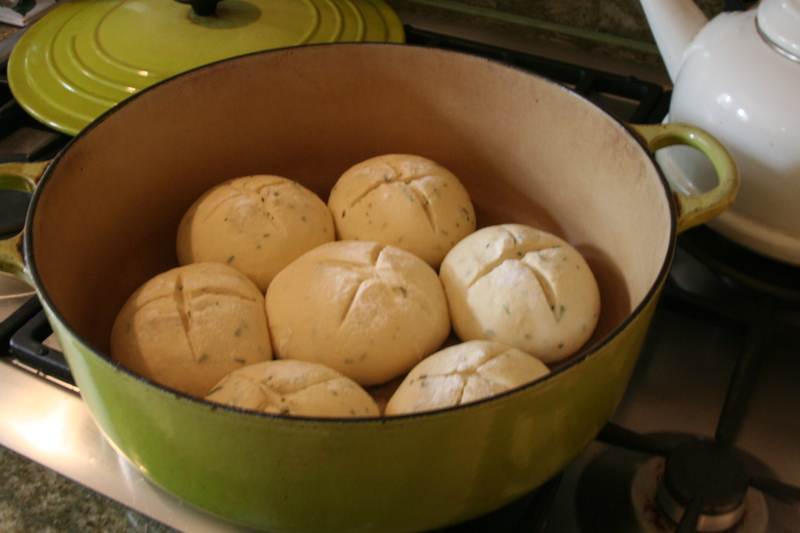 Transfer your dough from the mixer to the oiled bowl. Cover with a damp towel. Allow it to rise for at least an hour (in my kitchen it usually takes at least 90 minutes–and more typically 2 hours) until doubled in bulk. If I want it to rise more quickly, then I heat my oven to 100 degrees (this is a very low setting and many ovens don’t go this low, but you could just heat your oven for 4-5 minutes, then turn it off…) and proof the dough inside the warm oven. 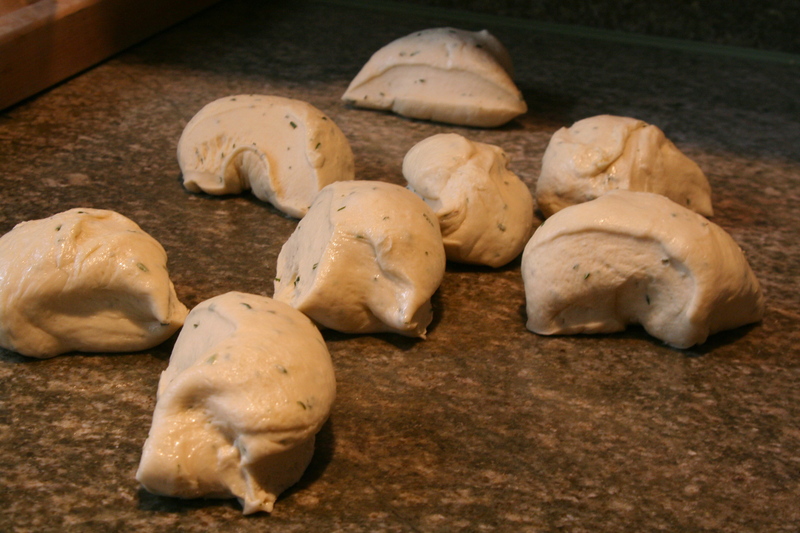 Step Four: Time to prepare my pans for baking, then mold the dough. First, I take out a sheet of parchment paper and place it on a cookie sheet. I reuse my sheets of parchment paper 2-3 times. I sprinkle the paper with rice flour (you can also use corn meal or regular flour) in order to easily remove the bread when it’s baked. 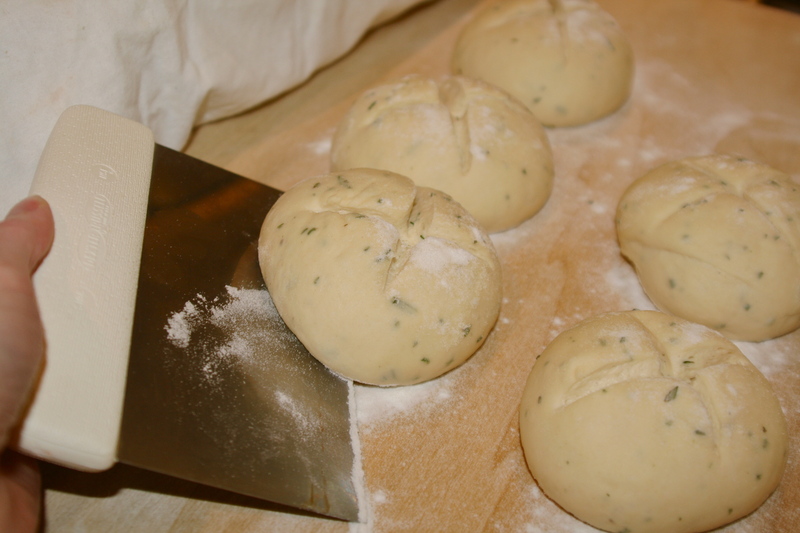 Divide the dough in half with a sharp knife or dough scraper. Then divide each piece in half (that makes four). Then halve the little doughlets again (that makes eight!). Then in half again!!! 16 🙂 I love making rolls; my brothers can mold rolls using both hands at the same time. I’m not that gifted. Maybe someday. To shape the rolls, fold the dough in thirds, then with the seam side down, begin to roll the dough like a top across your counter, spinning on the inside of your cupped palm. 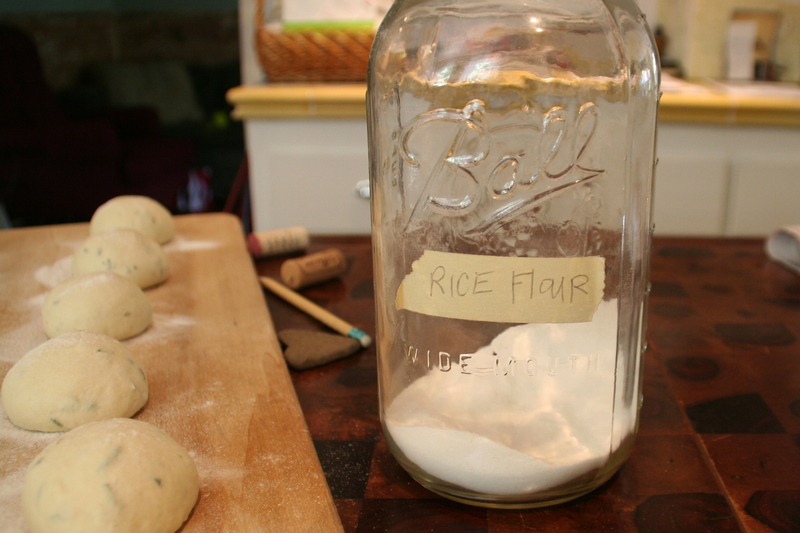 Make sure your counter is clean and not dusted with flour, so the dough sticks to it a bit. I tried to demonstrate this in the video. Once the rolls are shaped and placed on the parchment paper, cover them with a damp cloth. Step Five: Allow the dough to again double in size. This rise takes less time than the first, usually about 40 minutes to an hour. About 30 minutes before baking, preheat the oven to 500 degrees. Step Six: Your rolls are ready to bake and the oven is HOT. Place your cookie sheet onto the baking stone in the center of the oven. Take a spray bottle and spray in your oven, (I like to spray below the bread, but be careful of the heating elements…) to create steam. I typically do this twice during the first 10 minutes of baking. Bake for 10 minutes. Reduce the heat of the oven to 425 degrees. 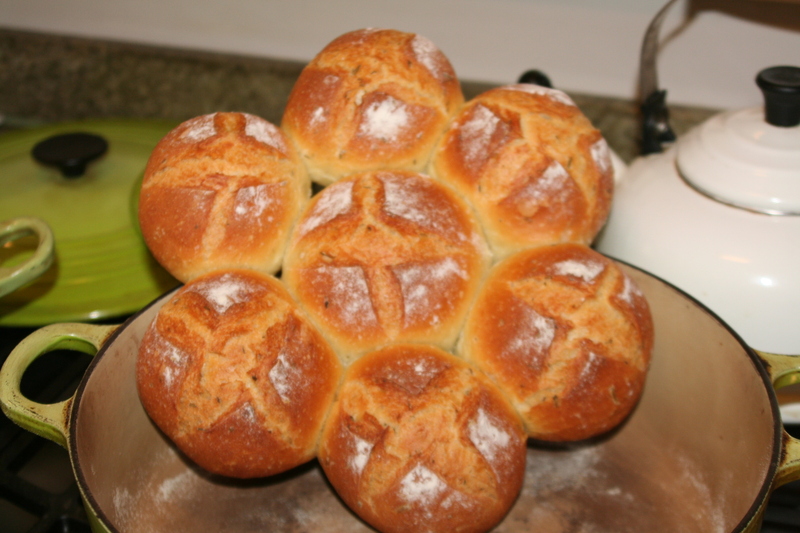 Rolls take less time to bake than larger loaves–I typically bake the rolls for another 16-18 minutes (a total of 26-28 in all).